I somehow got it into my head that I should try making ice cream cones. It wasn’t just the idea of making a frozen dessert and scooping it onto a cone that was fascinating me. It was actually making the cones themselves that I had to do. I wasn’t so concerned with the waffle texture and using a proper pizelle maker, but I did want to form cone shapes not just drape tuille circles over little bowls for crunchy cups. I ordered a cone roller , and was ready to experiment. There are recipes for ice cream cones in The Perfect Scoop , and I opted for the Honey-Cornmeal variation with added chopped rosemary. I’d already decided on the Cayenne Cantaloupe Sorbet from the Humphry Slocombe Ice Cream Book , and honey and cornmeal in a cone seemed like a good match for it. Now, I enjoy a good kitchen challenge as much as the next obsessed home cook, but I will say that making the cones was one of the trickier things I’ve attempted lately. David Lebovitz offers some great tips for baking the batter in the oven and rolling the cones, but there are a lot of variables at play here. I drew six-inch circles on the back of parchment paper which lined the baking sheets. Then, I was able to spread the batter thinly, as instructed, to fill the circles. A baking time of ten to fifteen minutes was suggested, but that produced edges that were far too crispy to roll. You need to catch the baked batter at just the right moment when it’s set and cooked through but still pliable enough to roll into a cone. Oh, and you have to do this while it’s hot, which burns your fingers a bit. After one or two ugly results from trial and error, I pulled on some plastic gloves and got determined about this. Finally, a few cones seemed worth keeping, and the dessert plan was able to happen. There are a couple of other sorbets in the Humphry Slocombe book I also want to try which involve Hibiscus Beet and Thai Chile Lime, but I had a cantaloupe on hand so this one came about first. It’s a simple puree of a whole chopped cantaloupe, sugar, a pinch of salt, a couple of tablespoons of rice vinegar, a couple of tablespoons of vodka, some lime juice, and some cayenne. I usually always say that I add more of any hot chile ingredient in a recipe, but here, the one-half teaspoon called for was actually more than enough. I’d use a little less next time. All of the ingredients were pureed in a blender and then poured through a sieve before being chilled and then churned in an ice cream maker. While it spent some time in the freezer to firm, I set about the project that was making ice cream cones. The batter was made with an egg, an egg white, honey, melted butter, sugar, flour, cornmeal, and a little chopped rosemary. Two tablespoons of batter was used for each cone, and it was spread into a six-inch circle on a parchment-lined baking sheet. The batter baked for about six to eight minutes until set and golden at the edges. Once removed from the oven, the baked circles were flipped over with a metal spatula and immediately rolled into a cone on a wood form. The edges should be golden but not so crispy that they break when rolled on the form. Plan to test the first two to gauge the needed baking time. Also, wearing plastic gloves helps with touching the hot cones while rolling. When slightly cooled and firm, the cone was removed from the form, and then next cone was shaped. Since there is a small hole in the bottom of each cone, I melted chocolate for dipping. When the chocolate set on the tips of the cones, the holes were sealed. I don’t think I’d want to make homemade cones for a large party, but they were a fun treat for just a few desserts. And, the chile-spiked, fruity sorbet was a great flavor for the cornmeal cones with a hint of rosemary. If you’re going to burn your fingers for a kitchen project, it should be one with a result at least as delightful and tasty as this one. Those are interesting flavors. A great combination! You are a genius. Both the sorbet flavor and the cones sound delicious. Lot's of work for a dessert, but sounds well worth it. I always wanted to make cones. It must be so nice to serve homemade ice creams in a homemade cone. I emember giving my sister a cone maker and an ice cream maker for a wedding present over 25 years ago. I personally have never attempted the cones. wow homemade cones! The combo of sorbet flavour sounds fabulous. What an incredible summer treat! Spicy and cool, all at once, just lush! It's never occurred to me to make my own cones! This sounds like so much fun! Love the flavor of the sorbet, too - that sounds incredible. This sorbet looks so refreshing! With that homemade cone, it just sounds perfect! This sorbet sounds really interesting, I can't wait to try it. Thanks for sharing, Lisa! I need your advice! It's been years since I was in Austin and my sister just got engaged and I need to throw her a party! Any tips on restaurants? There are so many great options! What's your email? I'll send a list. You made your own cones? 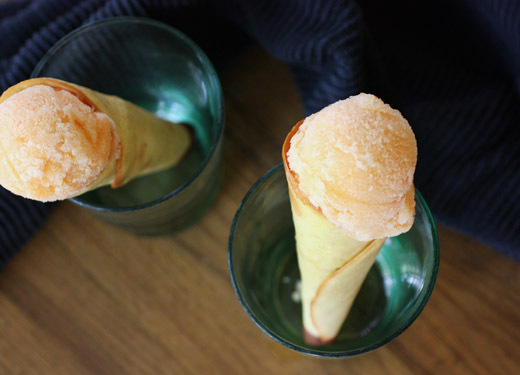 What an amazing combination of homemade cones and spicy sorbet! Lisa, I'm so impressed with your dessert project. Your flavor combinations in both the cones and sorbet sound wonderful not only on their own but especially when combined. Homemade ice cream cones? I'm so impressed! The cantaloupe sorbet looks nice too. Well done! Oh my goodness, this combo! I love the flavor of cantaloupe with something spicy. And those gorgeous cones are over the top! 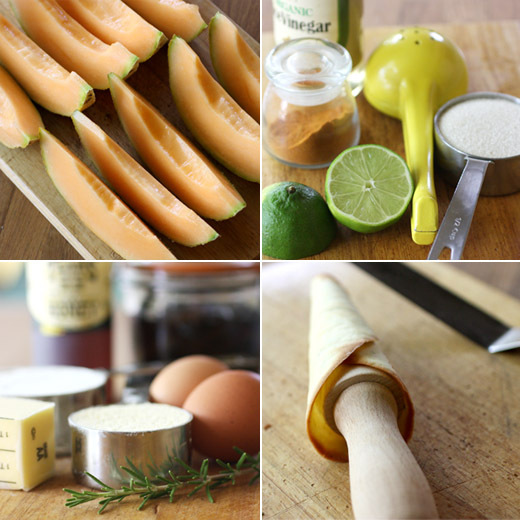 Cayenne Cantaloupe sorbet sounds out of this world! I love anything that is spicy-sweet! 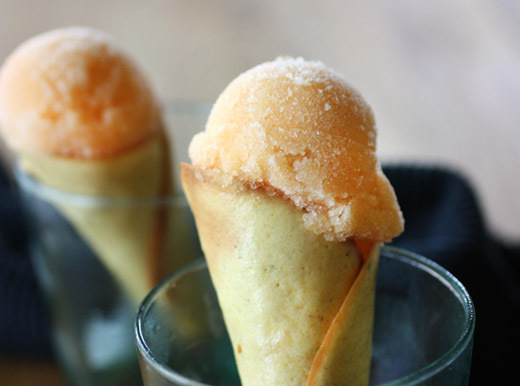 I've never had cantaloupe sorbets...but that sounds like a clever ingredient to use. i'm an ardent fan of the cone--ice cream served in a cup or bowl just doesn't have the same flair. kudos on a uniquely made cone with which to hold a uniquely flavored ice cream! The cone making sounded like a mission well-worth attempting and the results look great. Thanks for the recipe and great post.